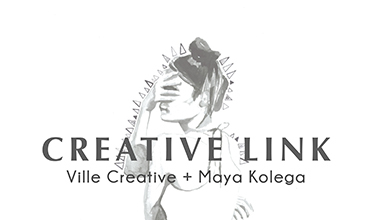 Come and join Ville Creative and Maya Kolega for the opening of Creative Link. You will be presented with a series of works filling the walls, created together by Claire from Ville Creative and Maya Kolega. Let the VilleXMaya works inspire you to use the creative tools provided on the night and add to the interactive piece that will complete the space. Joshy Willow, another creative link on the opening night of the exhibition, will be playing music to drive your artistic exploration while also showcasing for the first time his hand-made woodwork. This interactive exhibition is a celebration of how art can bring people together just as it has with the curators of the exhibition, Claire and Maya. Come to our exhibition with an open mind and a willingness to explore into the playful world of art.